Maurice O’Connell from Ballybunion Co. Kerry, a private soldier in the Royal Munster Fusiliers, was killed on the 21st August 1916 – the battle of the Somme. 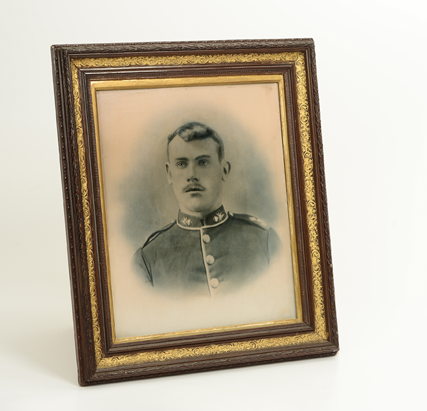 There are a number of artefacts related to Maurice O’Connell in the Museum’s collection. As we commemorate the First World War this year, 2014, this portrait provides a face for us to look upon. It is not the face of a dejected, defeated man but rather of a proud soldier in uniform. The portrait and frame were conserved in Spring 2014 with funding from the Heritage Council.